SOLSTICE will demonstrate its approach to strengthening research capacity through three case studies in Kenya, Tanzania and South Africa. These have been selected by SOLSTICE partners in each of the three countries. For more information on each, follow the links on the left menu bar. access and provision of logistical support for SOLSTICE activities. The small pelagic fishery is important for local communities in Zanzibar and mainland Tanzania as a source of food security, nutrition and livelihood support. This diverse group includes mackerel, sardines and anchovies – found in schools over the continental shelf, in bays and deep lagoons with nutrient rich waters. They are more abundant during the southeast monsoon, when stronger winds drive upwelling that brings nutrient rich water to the surface. Despite its importance for coastal economies, there is a lack of data and information about the fishery, which hampers effective management. Using robotics, modelling, remote sensing, field observations and socio-economic studies, SOLSTICE will identify key environmental and anthropogenic drivers of the main species and address climatic pressures on this fishery. The North Kenya Bank fishery is expected to spur economic growth for local communities. If well managed, it could help achieve national development goals, including poverty alleviation and wealth creation. Sustainability requires informed management interventions, but there is only scant information on the ecological status and drivers of the fishery. Using modelling, remote sensing, field observations and socio-economic studies, SOLSTICE will explore processes related to productivity and resilience of the ecosystems supporting the fishery, identify the main drivers of variability and change, and advise the fishery and government on how to optimise use of this important resource. The collapse of the Chokka squid fishery in 2013 had a devastating effect on the Eastern Cape, one of the poorest provinces in South Africa. The reasons for the collapse are unknown, although local fishermen believe it happened as a result of environmental change. 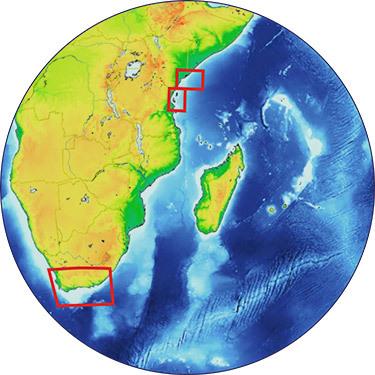 SOLSTICE will address key environmental and anthropogenic factors controlling the ecosystem dynamics of the Agulhas Bank. The results will help explain why the fishery collapsed, and inform the fishery and government as to whether the current recovery is stable, or whether similar collapses are likely in the future.